Ronnie “ProMod” Smith goes into the Ohio National Trail Super Strip Nationals with a 247 point lead, thanks to a consistent start to the 2018 Million Dollar PDRA Season. The opening race at GALOT saw Smith go to the Semi-Finals after taking out the first round against the NTR (No Time Recorded) of J Davis Jr and Rnd 2 with a 4.037 @ 173.54mph over Chris Garner-Jones 4.146 @ 172.19mph. The Semi-lined Smith up against Brunson Grothus and saw him lose with a quicker 4.002 @ 173.61mph to Grothus’ 4.022 courtesy of a 0.100 to 0.023 reaction time deficit. Race 2 at MDIR in Maryland saw Smith got to the Final round against Eric McKinney. Smith made his way through to that final round with wins over Eric Litton Rnd1, 4.022 to 4.070, Rnd 2 over Brunson Grothus with a 4.002 to 4.060 and a bracket like performance in the semi-final, again running a 4.002 to put away Chris Garner-Jones’ 4.014. Stepping up to a 3.973 in the Final wasn’t enough to overcome a 0.079 to 0.022 holeshot and a slower but winning 3.998 from Eric McKinney. 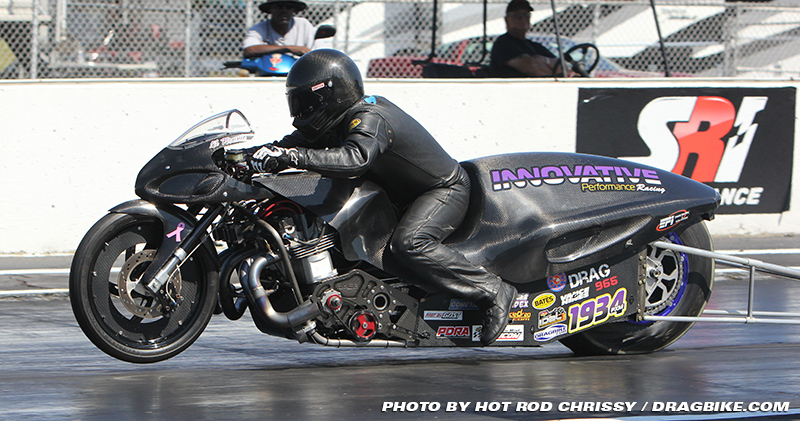 US131’s Race 3 on the PDRA tour saw more 4.0’s from Smith’s machine. A 4.018 @ 175.71mph took the Rnd 1 win against S. Allen’s shut off 7.233 @68.38mph. Another 4.0, 4.024 @ 173.14mph saw Smith fall short of Ashley Owen’s 4.017 and ended the day. The mid-season race at VMP saw Smith run another pair of 4.0’s with a 4.085 @ 174.50mph taking care of Rob Garcia’s 4.136 in Rnd 1 and a 4.065 @ 174.77mph falling short of Ehren Litton’s 4.037 to again end Smith’s day in Rnd2. With 16 Rnds of racing left at 100pts a round, Smith see’s himself 247pts, just under 2 1/2 Rnds ahead of Terry Schweigert with Chris Garner-Jones a further 7pts behind in third place. Ohio will be the possible springboard for Smith to stretch his lead or chasing teams to mount a second halt season challenge for the 2018 Drag 965 Pro Extreme Motorcycle Championship. Based in Pittsboro, North Carolina, the Professional Drag Racers Association is the top sanctioning body in the United States for the sport of eighth-mile drag racing. The PDRA’s professional categories include Pro Extreme, Pro Nitrous, Pro Boost, and Pro Extreme Motorcycle along with Top Sportsman, Top Dragster, Pro Jr. Dragster, and Top Jr. Dragster. The 2016 PDRA schedule consists of nine national events. For more on the world’s premier eighth mile drag racing organization visit www.pdra660.com. Follow the PDRA: Facebook, Twitter, Instagram, YouTube.